I recently had the absolute joy of making an entire collection for an amazing couple’s wedding. 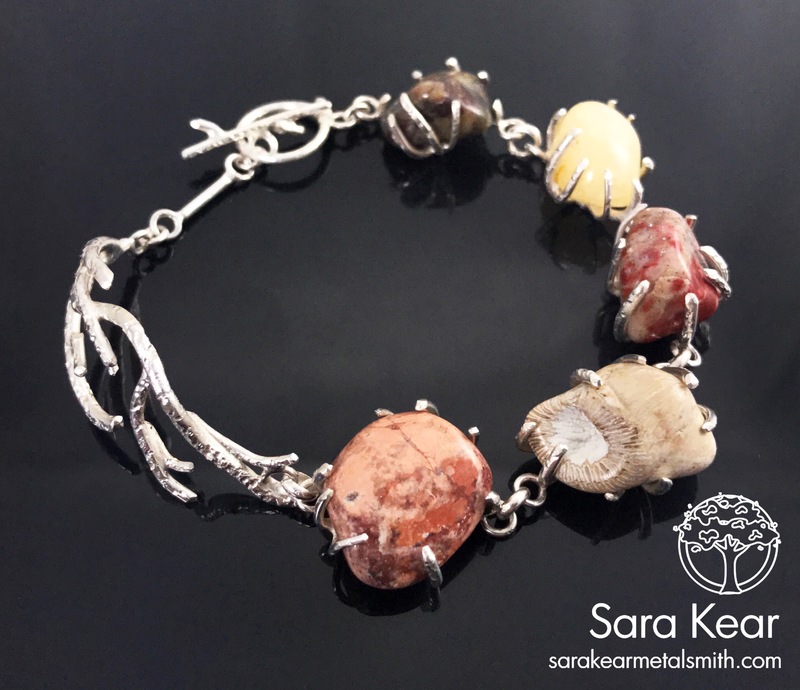 It is so much fun making a cohesive collection of jewelry pieces. I love working with a single theme and seeing where it takes me. 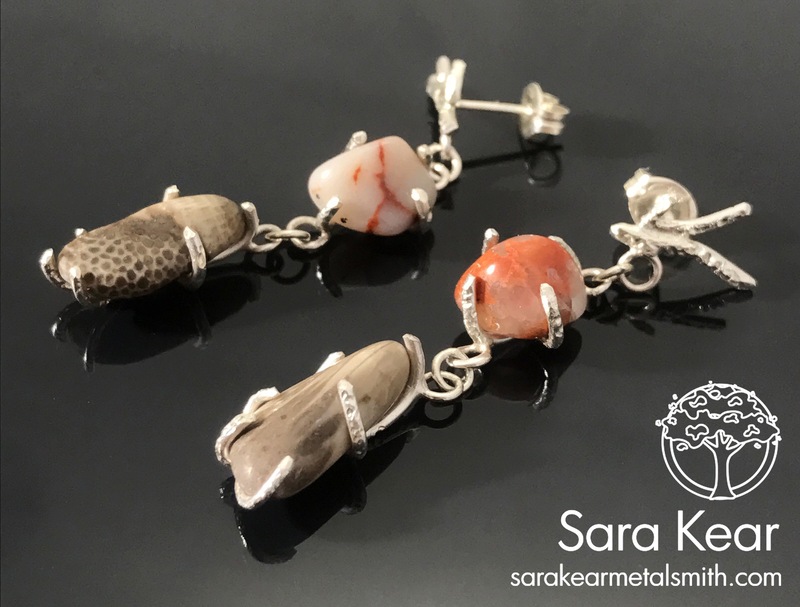 The couple wanted the pieces to incorporate the look of branches, be made of sterling silver and include stones they had gathered at a lake for their pieces and kyanite for the bridesmaids. Other than that I was given a budget and able to do whatever I wanted within those parameters. So amazing! So here it is, the Branches Wedding Collection! 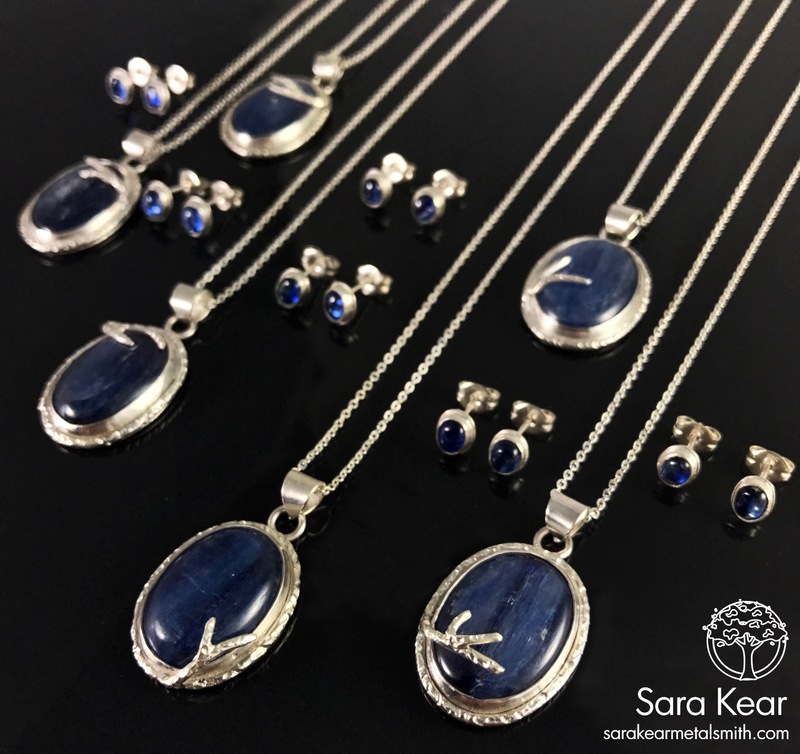 The bridesmaids each got a necklace and earrings of sterling silver and kyanite. 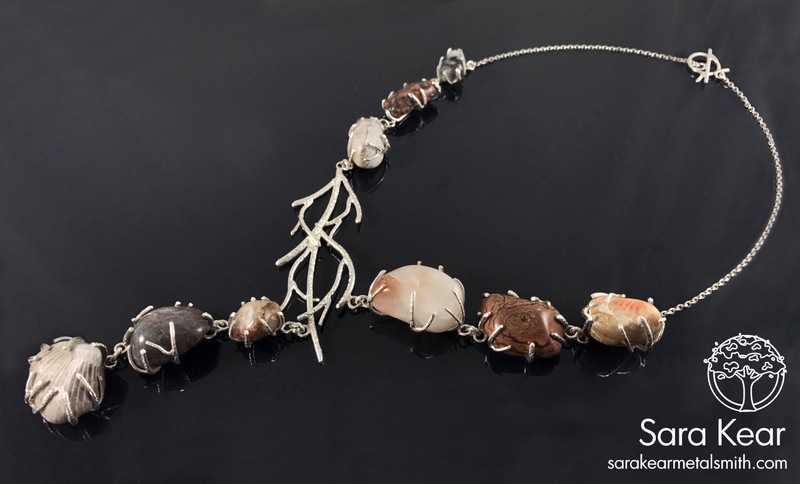 Each necklace was made to be slightly unique. Because you know, it’s more fun to make everything a little different. The bride’s earrings. The stones and fossils were found by the bride and groom on a lakeside vacation. We then took them, sorted out the possible favorites and tumbled them all over the course of two months! I hadn’t tumbled stones since I was a kid so it was a ton of fun to relearn about the whole process. Not to mention how satisfying it is to take out the newly shiny pebbles! 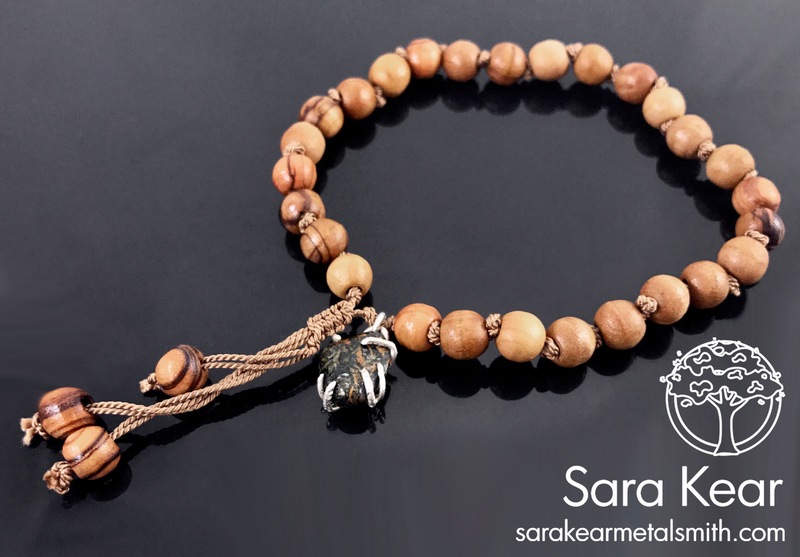 A mala bracelet made of olive wood and knotted silk for the groom. Anyone else interested in short, adjustable knotted silk mala bracelets? I enjoyed making it, even got the chance to relearn a macrame knot! I also had the opportunity to make my first hair comb! I now want to make these for everyday wear! And no wedding set is complete without the rings! 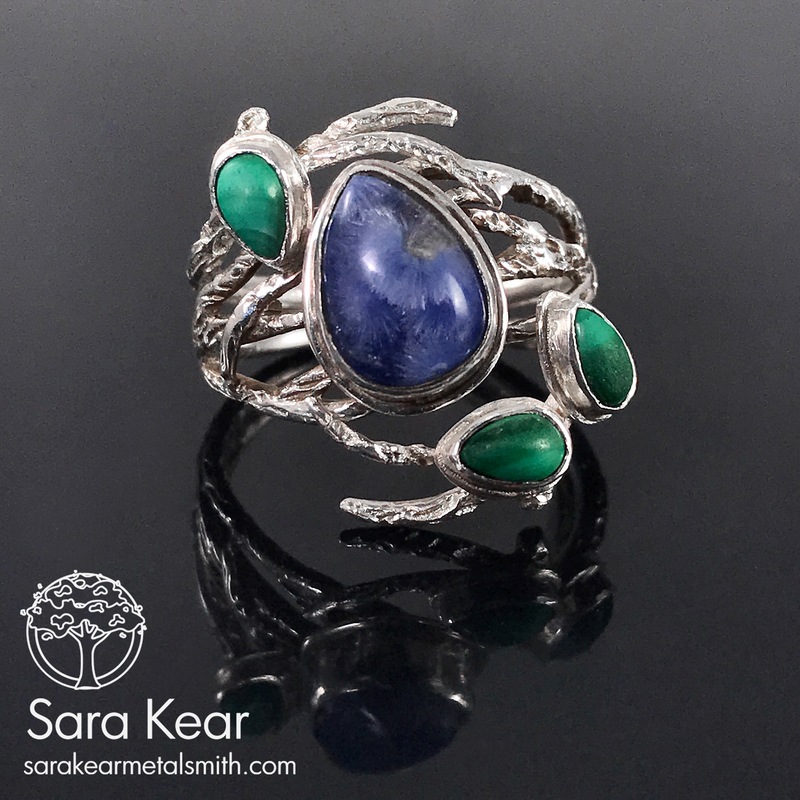 Her rings are made of sterling silver, malachite and Quartz with dumortierite inclusions. 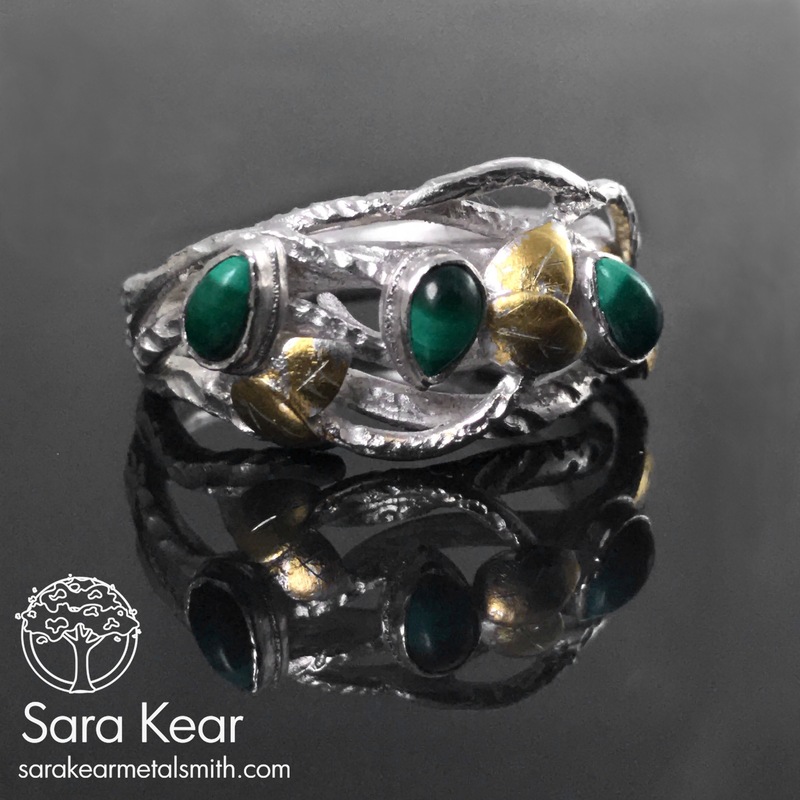 The rings nest together with the quartz as the engagement ring and the malachite as the wedding ring. And last but not least, the groom’s wedding band. This one also included keum boo, fusing thin sheets of high karat gold to fine silver, for the leaves. Such a beautiful effect! Thanks so much to this beautiful couple for giving me the opportunity to make this series! And congratulations on continuing your lives together! What do you think of my new jewelry series? Would you like to see branch pieces available in my Etsy Shop? Do you have a wedding coming up and want a custom piece or pieces made just for you and your partner? Next postI’m on the Moon! 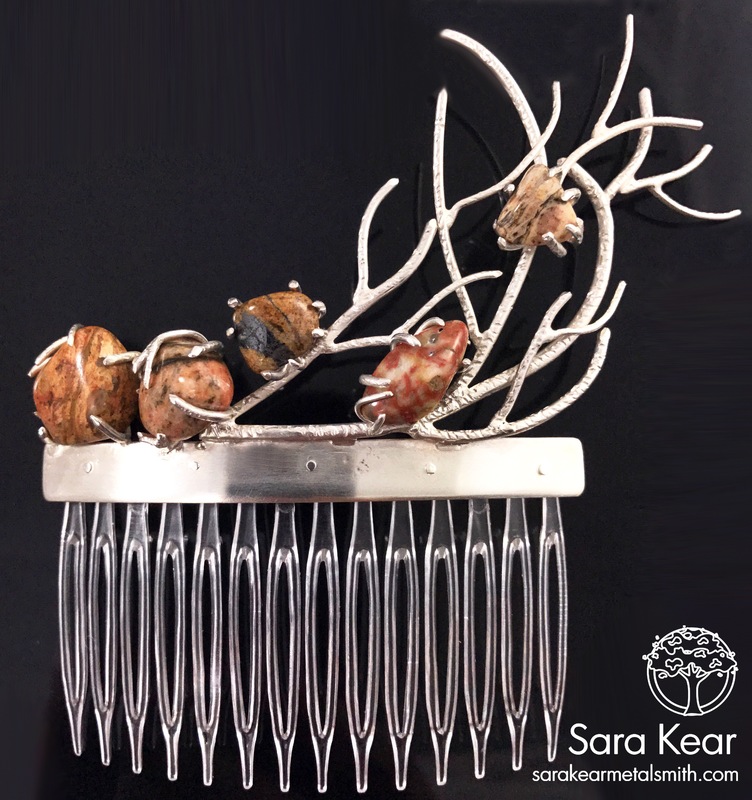 Sara…WOW!!! 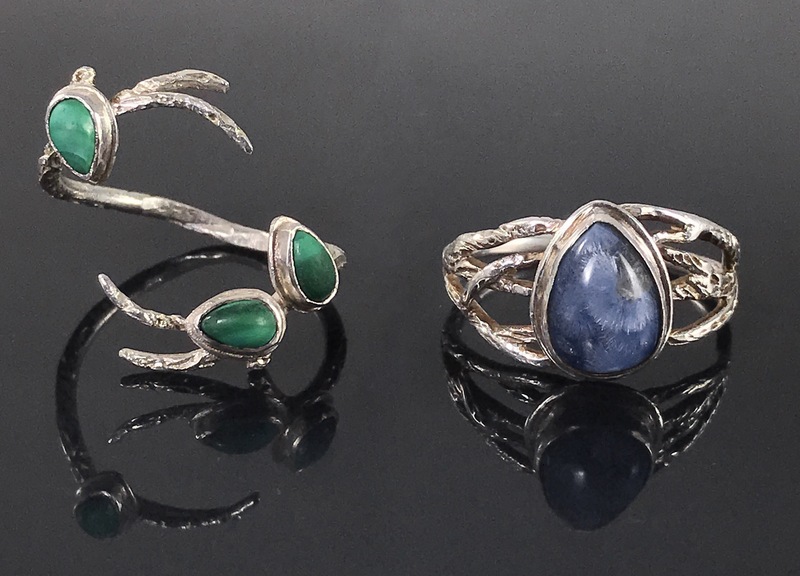 These are all very beautiful pieces! I had no idea rocks from the shore would ever look like this after being tumbled! Makes me want to get a tumbler and see what happens with mine:-) Thanks so much for sharing. Laura, thank you so much! I highly recommend tumbling your rocks. It takes awhile, about a month, but it’s totally worth it! If you decide to go for it and have questions don’t hesitate to ask. I’m certainly not an expert but I figured a couple things out at least!